So occasionally the Lord speaks to me. It’s not an audible voice. It’s almost always a picture in my mind, followed (usually) an explanation of what it means and clarification for whom the Word is for. That may sound crazy-timez to you. But that’s okay. Anyways, like I said, occasionally God speaks to me. He will totally speak to you too if you ask Him. For reals. When I was in fourth grade, I started reading the bible. I would read four chapters a day, because that’s what my mom did, so I thought that’s what all christians did. I don’t even do this now, but how cool was my fourth grade year? In fact I read four chapters a day for about ten years. In fourth grade I learned that King Solomon was the richest dude in all the land. I thought that sounded nice. Plus he saved babies by not cutting them in half (1 Kings 3:16-28 for that CAH-Razy story). I thought he was pretty legit, so I decided to do what he did so I could become like him. So, I asked God for wisdom. I think I prayed this every day for over a year. I wanted to be awesome too. What I really wanted was God’s blessing on my life, in in my fourth grade mind that meant riches and saving babies. All I’m saying is that if you ask God for something that He wants to give you, He’s going to follow through on it. I believe He gave me wisdom because I asked for it, and He continues to give me info that is wise, because I keep asking for it and believing that He will tell me what I need to know. Like I was saying, sometimes when I ask God about something, He gives me a word picture answer in prayer. Like instantly. So, I can’t guarantee that this word is for you, since I was asking Him about me, but you can pray on it and decide for yo-self. There just might be truth in it for you. Picture a hot dog stand in some chill city (like Seattle or San Diego), with a lady running the stand. Everyone that comes up to the stand is on vacation or lunch break, so they are feeling pretty chill. They are here to get their tasty food, and then walk on to enjoy the sights or whatever. There’s even a section on the stand for mustard, ketsup, relish and napkins. KUH-Lassie. The weird part is, the lady running the hot dog stand thinks she is running a restaurant, like – be seated by the host, sit down and order, pay a tip kind of place. With chairs. She keeps trying to get relaxed vacationers to sit in lawn chairs in an organized fashion on the street. She can’t imagine why they won’t listen and are so chill about just moving on. She’s stressin’ about details that aren’t even real! And people are sorta wondering what her deal is. I am totally that hot dog stand lady. Perhaps my poor husband and kids are my customers in crazy town, confused by why I won’t just serve them a dog with a smile, keep the ketchup dispenser clean and chill out to enjoy my easy job. 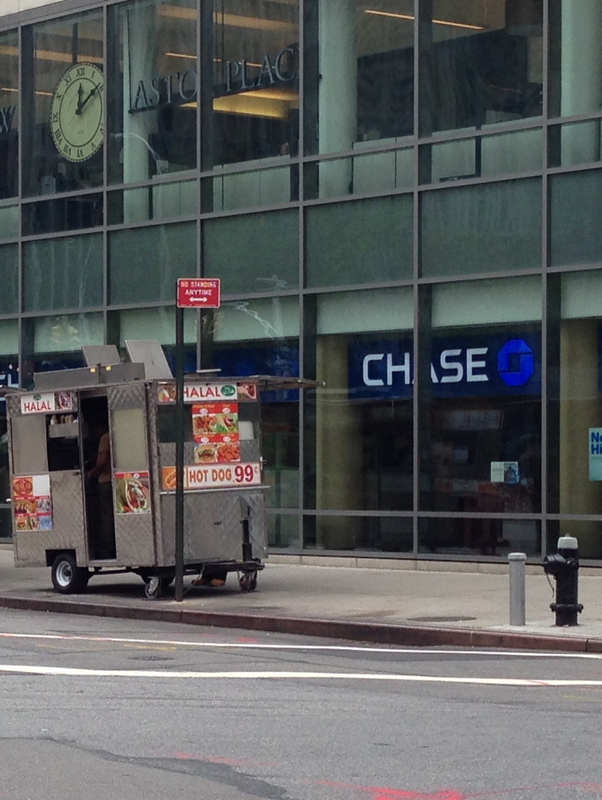 Compared to running a restaurant, a hot dog stand (I would imagine) is a cinch! Hot dog stand lady is making her life way more work then it needs to be, she should just chill out, serve some tasty dogs and read a magazine, or listen to music while she waits out the lull between customers. Then close up shop around 2pm and head on home. No floors to sweep or anything! So, that will never happen. But I try to make it happen. Every day. And I get NO WHERE. Actually, that’s not true, I VISIT CRAZY TOWN. And I totally drive myself there, probably with a gps and printed directions and a best time to beat with no traffic and stoplights. It’s insane. And expensive. It cost me my joy. It makes me grouchy. Like public restroom with twin toddlers grouchy (post coming on that soon to even out this seriousness). God is helping me. I need to let Him. You know what’s super sad? This is my fast. Our church is doing a 40 day fast in preparation for a Prayer and Healing Night in September and I felt like the Lord asked me to fast my agenda, and the idea that I can or should accomplish everything under the sun in one day, when I’m responsible for three little humans all day. And when I don’t I feel like a HUGE fail. So it’s like a fail fast. The fast He put before me has no boxes to check either, and you know how much that bothers me? SO MUCH. How will I know I did it if there isn’t a box to check off at the end of the day? Ahhhh!!! I will have to check-in with Him instead. In fact, I’ll have to be checking in with Him all throughout the day as I surrender over all the little moments I try to run a restaurant from a hot dog stand. So, I am fasting “being a crazy hot dog stand lady”. At least now it’s clear and has a catchy title. I will update you on how awesome my life becomes when I start serving hot dogs and stop trying to run a restaurant on the street.